Copying and pasting in PowerPoint Online differs from copying and pasting in the PowerPoint desktop application because of certain web browser limitations. Select the text you want to copy, and then on the Home tab, select Copy. Click where you want to insert the text, and on the Home tab, select Paste. Note: If you are prompted for access to the Clipboard, click Allow Access. ﻿Select the text you want to copy, and then on the Home tab, select Copy. Click where you want to insert the unformatted text, and on the Home tab, select Paste > Paste Text Only. Currently, Paste Text Only is only available in Chrome, Microsoft Edge, and Internet Explorer. And for Chrome, you need an Office Online extension to use this command in PowerPoint Online. Select the slide or slides you want to copy, and then on the Home tab, and select Copy. Select the slide you want to insert after, and select Paste. If the slide or slides you copied come from a different presentation and you want to keep their original formatting, Click the (Ctrl) button that pops up at the bottom-right corner of the pasted slide, and select Keep Source Formatting. When you're copying-and-pasting slides within the same presentation, Keep Source Formatting currently isn't supported. You can copy and paste pictures from one slide to another in the same presentation or another presentation. You can also copy pictures from web sites and paste them to your slides as long as you have a license for the image. However, PowerPoint Online doesn’t support pasting pictures that are copied from Outlook. 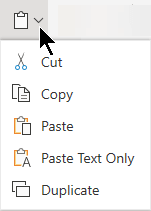 If there’s a picture in Outlook that you want to use in PowerPoint Online, save the picture to your computer, then go to Insert > Picture in PowerPoint Online. Note: As with the PowerPoint desktop application, you can only copy and paste text and pictures in Editing View. You have to use keyboard shortcuts to copy and paste text in the Firefox browser. While you can use the procedures above to copy and paste pictures in Firefox, you can also use this same procedure for pictures. Select the text you want to copy, and then on the keyboard, press Ctrl+C to copy. Go to the slide where you want to paste the text, and on the keyboard press Ctrl+P to paste.